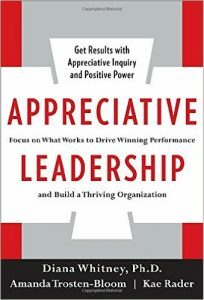 Appreciative Leadership shows you how to fully engage your team through positive inquiry and open dialogue–so that everyone feels included and valued, inspired and motivated . . . and ready to work together to win. In this user-friendly guide, you’ll discover exciting new techniques to open up discussions, exchange ideas, agree on a plan, and follow up on your goals. You’ll learn simple tips on how to keep your team on track with a can-do attitude. And you’ll find satisfying new ways to be engaged, passionate, and present. This book isn’t a quick-fix solution to your management problems. It’s a full-time, lifelong commitment to your values, your vision, and your connection to others. This is how the best leaders in the world bring out the best in people, their organizations, and themselves. This is Appreciative Leadership.